Fancy an amazing Asian stir fry? 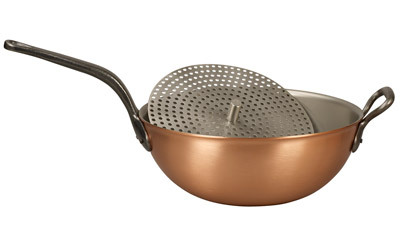 By all means, but this versatile copper beauty will do a lot more. It is also a steamer. Think crisp, moist, flavourful, steamed vegetables. And it will poach, fry and braise. Diameter 28cm; Height 10cm; Capacity 3.5 litres; Weight 3.5kg. 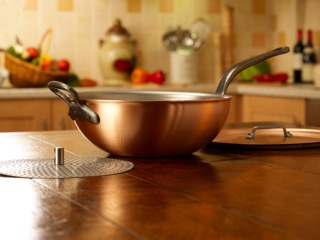 Heavy copper construction (2.3mm); conductivity and timeless appeal. Brushed copper exterior; elegance and ease of maintenance. Stainless steel interior (0.2mm), bonded for life gives utility and appearance. Ergonomic, everlasting, cast iron handle and helper.